^ Nov 27, 2013 (27 November 2013). 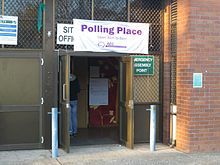 "AEC Finalises $58 Million Of Election Funding To Candidates In Federal Election". Australianpolitics.com. Retrieved 19 September 2017. ^ "Parliament of Australia: Joint Committee on Electoral Matters: Home Page". Aph.gov.au. Archived from the original on 8 January 2011. Retrieved 25 December 2010. This page was last edited on 10 April 2019, at 23:50 (UTC).